My Facebook page lists Texas City, Texas as my home town. I wasn’t born there, but it is a place of special memories for me. For me, Texas City was the place where I first gained autonomy, where I was generally allowed to run free as long as I stayed on the east side of 6th Street. Texas City was the place where I discovered that there was a model railroad hobby, an event which would serve to guide many of my career choices for the next fifty years. Texas City was, and is, a special place to me. As towns go, it’s pretty bland. It is a refinery town and a sea port, so there are lots of railroads and ships, perfect for me. It is also a down-to-earth kind of place, and not just because of its working class roots. Texas City is right at sea level on Galveston Bay, near the coast of the Gulf of Mexico, a few miles inland from Galveston. That fact means that Texas City always keeps an eye on the horizon. Hurricane season in the Atlantic begins June 1st and ends November 30th, and hurricanes have directed Texas City’s life, and mine. Before they named them, a hurricane destroyed Galveston in 1900. Some sources put the death toll at 6,000, while others say 8,000 and even 12,000 people. Whatever the number, Galveston was largely wiped from the map. At one time, a nearby town called Indianola had competed with Galveston for port supremacy, but two hurricanes, one in 1875 and a second in 1886 finally convinced the town’s residents to move on to a better location. While Indianola folded, Galveston dug in and built a sea wall. Tropical storms are such a regularity for the Texas Gulf Coast that most individuals living there know that when a storm approaches, the best solution is to pack up and go inland until it passes. To be sure, there are the few that choose to stay and ride it out. In earlier days, hurricane parties would roll on upper floors of hotels in the affected areas, more than often resulting in a loss of life. With modern times, the authorities force everybody to evacuate, but there still are those who choose to stay. These people show up periodically as part of the fatality statistics associated with each storm. In recent memory (2008), Hurricane Ike killed 195 people. 123 of those dead were in the United States, and 23 people are still missing. Prior to that, the disastrous 2005 hurricane season included Hurricane Rita, which made landfall near the border between Texas and Louisiana, resulted in 120 deaths. A few miles further down the coast, Hurricane Katrina caused the deaths of 1,836 people, in part because of the failure to evacuate people from the storm’s path. Even when they don’t become hurricanes, tropical storms are dangerous and produce property losses. Texas City has an established elevation of ten feet, which is to say that when the tropical storm rolls inland, the force of the winds push the waters inland with them. Like Galveston, Texas City has installed barriers to minimize the damage caused by the storm surge, but it was not always that way. In 1915, a hurricane largely wiped out Texas City; after it passed and the town tried to return to normal, more than half of the houses there remained vacant. People chose to not come back to the devastation. Looking back, I wonder about what drives people to return to such a place, knowing that whatever they had left there would be ruined. That their home would be destroyed and any valuables that had remained would be damaged beyond repair. I got to see it first hand. 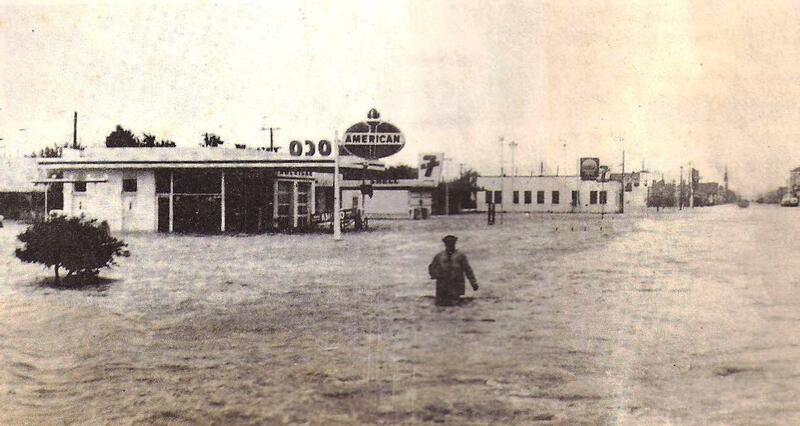 It was 1961 and Hurricane Carla was the storm’s name. Things changed for me because of that storm. By the purest of chance and fortune, my family and I were largely spared, and I still marvel about it to this day. It was a powerful storm and Carla made Dan Rather’s television career into a national one. It was the first time that a storm had been covered live by television, a matter which we take for granted today. My parents were well educated people, my father was a research chemist at a lab for one of the refineries in Texas City. As part of his career, we had already moved several times; it was just part of the job. But in a decision which I still regard with some confusion, it was decided that I would be going to private school instead of staying with the Texas City public schools, and that meant moving to Houston. These days, it is the fashion to blame one’s parents for everything, but I cannot fault my parents for trying to do the right thing for me. The effects of going to private school are material for another blog posting at another time, but that is not the purpose of this. In addition to sacrificing for my benefit, there was an interesting side benefit. We moved out of Texas City two days before Hurricane Carla made landfall near Port Lavaca, Texas, a few miles down the coast from Galveston. Our largely vacant house in Texas City would be filled with water that was three feet deep, along with every other home in that small town. You look back and marvel at such things. Everybody that was there remembers. A good friend and I were talking about Houston, and I asked her where she had been during Carla and she perked up and smiled, saying, “I was born during Carla“. They call it the Hurricane Baby Theory, and she was anecdotal evidence. I was talking with a business associate when I discovered that he was from Houston. I asked him “Where were you during Carla?” and he remarked that they were safe at home, but he remembered looking out his window and watching it rain, for days. I remember the endless rain, too. It never seemed to end. And then the lull in the rain when the storm’s eye passed nearby, and once passed, the return of the relentless rain. After Carla had passed, and people were allowed to return to the coast, my mother and I went back to our house in Texas City to retrieve what had been left behind. 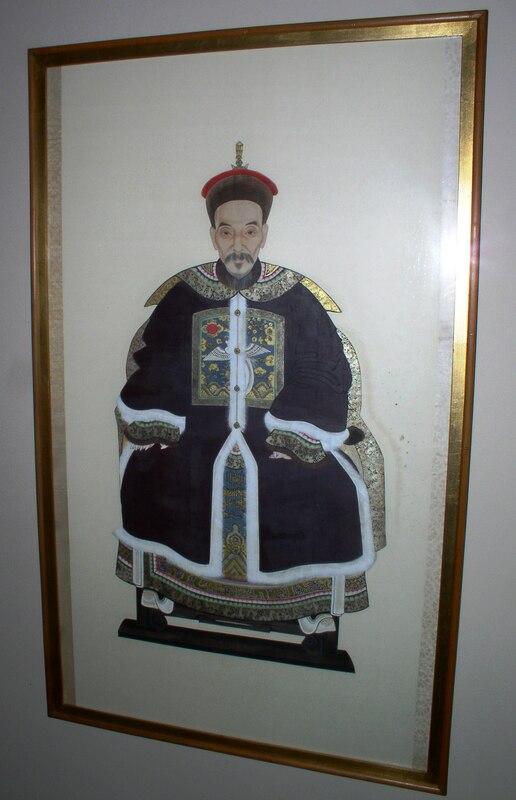 Of particular interest was a Chinese ancestor painting. It had been left hanging on the wall because there had been no room to carry it. As we drove into Texas City, the devastation was everywhere. Stacks of debris lined the road; tree limbs, sodden furniture, appliances, all destroyed by Hurricane Carla. Texas City had a seawall, but it had not been able to stop the waters of the storm surge, which had flowed into the city through the storm drains; what was meant to be a conduit for water to flow away from the city instead became the path for sea water to enter the city. Our former house was waterlogged, and the landlord was inside the building with a crew that was cleaning up. The wooden floor boards had buckled up from the salt water. Baby rattlesnakes had been found in one corner of the house. The ancestor painting was still hanging on the wall, but had been slightly damaged by the lapping waves of water that had flowed into the house. In all, we had been most fortunate. We went down the street to see a classmate, a guy named Wayne Froschl, who lived a few doors away. He was a good buddy, someone that I had spent a lot of time with. We had gotten into trouble together (on more than one occasion), and I liked him greatly. Wayne was with his parents, and they were shoveling out the mud from their home. It was an awkward moment and sad. I never saw him again after that day; two years later, my family would be in Ohio, then Atlanta two years after that. I look back at that and marvel at the power of place, the instinct that tells you to stay where you are planted, to remain where you are always in a slight state of danger, where the water can come and take you away. Wayne stayed there, went to Texas A&M, married a girl from Galveston, took a job there and was killed in an a collision with a concrete truck. He is buried in Galveston, his home. The Gulf of Mexico is nearby, and it is storm season. I have a favorite Texas weather story, and when I tell it to you, you will not believe it. Like so many others, you will laugh and call it yet another tall Texas tale, but I know that it happened. I saw it. Before Texas City, we had lived in Brownsville, at the very southern end of Texas. Near the Gulf and across the river from Mexico. My parents and I went there to visit old friends and toward the end of our stay there, it became apparent that a hurricane was heading directly toward Brownsville. Instinctively, my parents got us packed up and we left town around 4:00 PM, which was not our standard procedure. Dad was insistent, for being in Brownsville could have been hazardous, even though it was inland. As you head north, you go up from The Valley, which is filled with citrus groves and small farms. The towns roll by; San Benito, Harlingen, Sebastian and then Raymondville. Once past that point, U.S. Route 77 becomes a long and lonely stretch of flat highway bordered by mesquite and grazing cattle. At Raymondville, a road sign notes that there is no gasoline available for the next seventy miles. The King Ranch is on both sides of 77, along with other “smaller” ranches like the Yturria Ranch, but there is little else. As we left Raymondville, it began to rain, heavily. There was no other traffic on the road. Now after 6:00 PM, it had become dark. And, in the loneliest stretch of this dark lonely highway, it began to rain frogs. Looking out the windshield toward the front as we drove, it was obvious that frogs were falling with the rain. They were bouncing off of the hood of the car, off of the road. The windshield wipers were flinging them away with the rain drops. My parents and I stared at this with disbelief. We finally made it to Kingsville and called it a night. The weather was now behind us and we could continue on to Houston in the morning, but it is something that I can never forget. I tell that story to people, and they do not believe. They roll their eyes and chortle, but I know it happened. I saw it.